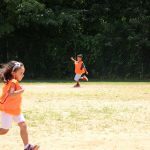 Thinking of field day activities is probably the easiest part of creating a field day. 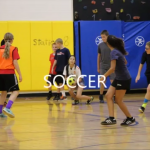 Here you will learn, scheduling, scoring, organizing teams, parents, teachers, maps and more. TIP: Months prior to the start of field day, ask for volunteers. 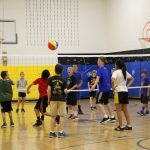 Get help from your pto/pta on setting this up. 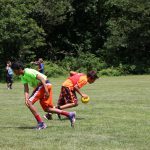 Once parents sign up for a specific event, send them a copy of the rules and score sheet. Ask them to come in to review with you. Most parents won’t come in, but at least you offered and the ones that do will be ahead of the game. 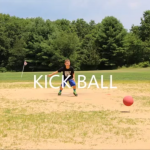 As the Physical Education Teacher, we know the parent’s will need some tips. Make sure you have a Nurses station, water station and scores table set up outside with tents. 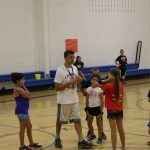 Assign a captain (volunteer parent) for each event. This is the person that should know all of the rules for the game they’re running. 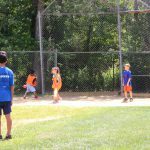 Assign helpers (volunteer parents) who can help the captain organize the kids, keep score, run the score sheets to the scores table. 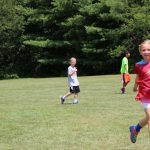 This field day example has approximately 320 participants. Four 2nd grades, four 3rd grades, five 4th grades and four 5th grades. 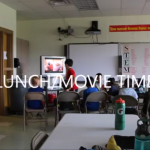 The entire school eats lunch in the classroom at the same time. After lunch each grade level is called to the gymnasium one at a time. At this time the team leaders (teachers) are given the team sign (card board or poster board) with the team name (2 R 1). Attached to the back are the map and team roster. 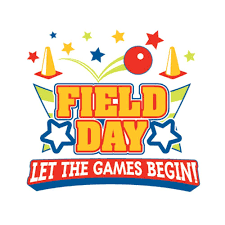 Note: Teachers and students will already know what team their on prior to the start of field day. 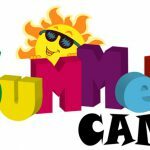 In addition to the poster board, each team leader should be provided with a water spray bottle to use on the students throughout the day. A quick good sportsmanship reminder and than the participants are sent to line up with their team leader, who be holding up their team name board. 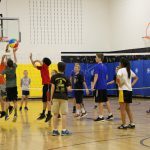 After attendance are taken for each team they will be sent to their first event and the next grade level will be called to the gym. This takes about 20-30 minutes. TIP: Start with upper grades first, because they will have more patients to wait for the younger students to arrive to their stations. You should have game signs staked into the ground at each location of a game to support your map. Play music the entire day. Stop the music to get everyone’s attention to rotate to next station when it’s time. Here is an example of the map that I use. Here is an example of a field day schedule that I use. No need to make this complicated. Three teams, red, white and blue competing in on event at a time. Highest scoring team for each event receives 3 points, 2nd highest 2 points and 3rd will receive 1 point. If there’s a tie for first place in one event, both teams receive 3 points and the 3rd team receives 2 points. GOOGLE SHEETS is great to use for score keeping. Tug of War: (12 pulls in total) Red team wins 5 pulls, blue team 4 pulls and white team 3 pulls. Red team would receive 3 points, 2 points for blue and 1 point for white. 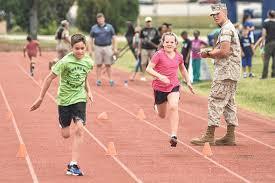 TIP: As the Physical Education you should run the most difficult station. I always set up tug of war to be later in the day, so I can run it. It get’s loud and it’s very difficult for parents to maintain control. 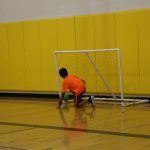 Box soccer is a tough game to run, so I always run the first round, so the parents learn how to do it. 2nd round I check on dodge ball. After than I’m free to roam around and help where needed, until it’s time for the tug of war to begin. The following games are played with 300+ students in a 3 hour time period. 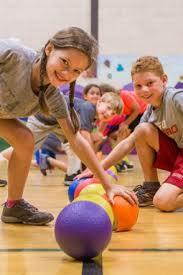 Box Soccer, Keep it up, Hyperspace (tag game), tug of war, jump rope, dodge ball, 40 yard dash, obstacle course. 8 games and one break for a snack/water break. Only two of the games on indoors and the other 5 games plus snacks are outside. Make life easy for yourself. Cross out the #’s as you call them during the game. 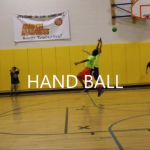 Break up the space of the baselines and sidelines of the basketball court into 1/3’s. This way each team will have the same amount of space to protect. Each team (red, white and blue) will be placed on the sidelines/baselines of the basketball court. Two foam soccer balls will be placed in the center of the gym. You’ll need on parent keeping score and shouting out the numbers. Two more parents to watch the balls for goals. 1 parent assigned to each ball. 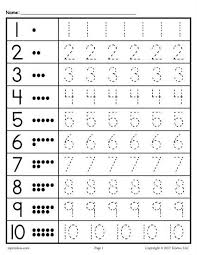 The Captain (parent) will call 3 numbers at the same time using their number chart. Remember to cross out numbers as you call them. 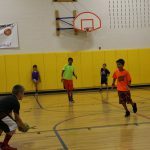 3 players from each team will run to the center of the gym to gain control of a ball and shoot it past the base line or sideline of the other two teams. The player that get’s to the ball first, must trap it before playing. This helps to avoid collisions! The ball must pass the baseline or sideline of one of the other two teams below head level to count as a goal. Since there are two balls being playing at the same time, only count the first goal scored. When a goal is scored, students will place the ball in the center of the gym and new numbers will be called. Hopefully each student will have their number called 3 or 4 times. The team with the least amount of goals scored on them will receive 3 points, 2nd least 2 points and the 3rd place team will receive 1 point. You don’t need to keep track of how many goals a team scores. What’s scored is how many goals go in on each team. The lower the number the better. Not much to this game. You need one parent to watch each group. 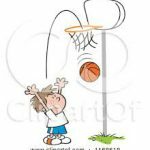 Object of the game is to hit the ball in the air without letting it hit the ground. Highest score wins. Don’t combine scores. 2nd and 3rd grade may double hit. 4th and 5th may not. If the ball hits the ground, start over from one. Highest score receives 3 points, seconds highest 2 points and 3rd place 1 point. Most important part of this game is to be organized. Have a list made up prior to field day for the order of pulls for each team. Give this to your parent captain. They’ll be able to keep track of this while you do everything else. Make sure it’s set up so each team has rest time in between pulls. VERY IMPORTANT to have a coned off area, that students must stand behind when not pulling. You may need to add extra players here and there if a team has less. For example; If Red 1 has 17 players and they’re pulling vs Blue 2 with 15 players, you’ll need to take two blue players from blue 1 to help out. 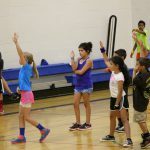 TIP: Train your students prior to field day in phys. ed. class how to set up properly for tug of war. Don’t grab the rope until signaled. VERY IMPORTANT, to stop pulling on the whistle. 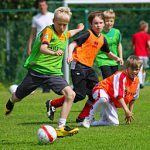 Kids are more likely to get hurt when they pull after the whistle. 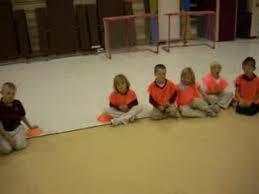 Remind students to stand up if they fall instead of hanging on the rope in a fallen position. Another simple activity. You’ll need a parent at the start and finish line. I advise spray painting your track on grass. You don’t want kids tripping on cones or falling on pavement. Be creative! Many ways to do this! Nothing more needed than this. CLICK HERE to check out a good obstacle course. I set up 3 of these side by side. TIP: Set course up, so once each player reaches the end of the obstacle course, they must run back on the left side and tag the next person in line. Another simple game. 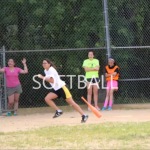 Whichever participant jumps for the longest amount of time without stopping, takes first place. You may need to break each team up into multiple groups, depending on how much space you have. No equipment needed. 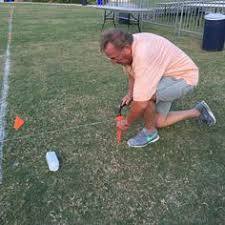 Just spray paint or cones to mark your field. I make it approximately 25yds X 60 yds but it can be played in a gymnasium if needed. A line is placed in the center of the field. When a player is on their side of the field they’re a tagger. When the cross over the center line they can be tagged. Object of the game is to cross over the back line of the other team without falling or being tagged. First team to get all of their players across the back line wins. Once a player is safely across the back line, they’re not allowed to re-join the same game until the next round. TIP: When the kids finish their last event, you’ll need a little bit of time to tally the remaining scores. Sit the kids together outside and have the parents/teachers hand out ice pops to everyone while they wait for the final scores. Use a gym stick to move a ball down around a cone and back to the start position. Each student takes a turn. Toss the bean bag into a hula hoop or pail. Option: Have students close their eyes or turn their back to the target. Run to the bucket and pour the water in. Return to line and the next student will do the same. Set a designated height in the bucket. Separate each team into two groups. Half of each team behind one cone and the other half facing them approximately 30 feet away. This will cut the distance in half. This is just a simple hula hoop race. Each team stands in a circle. They must hold hands and maneuver the hula hoop all the way around the circle until it reaches the starting point without breaking hands. 2 Players stand back to back balancing a balloon between their backs as they walk around a designated cones and back to their team. Each student takes a turn throwing a frisbee. You can measure distance, but at this age it’s not necessary to keep track of who’s winning. 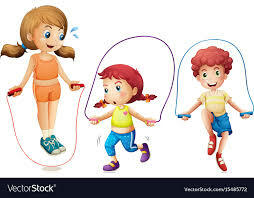 Use a tape measure or jump rope and students can jump for distance. This age level can handle a obstacle course. Tip: You’ll a few extra parent’s to help out with this event to guide any players that get confused on the course. 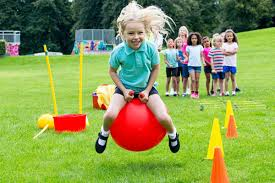 Equipment Needed for K & 1st grade field day. 4 sticks and small balls. 4 sets of bean bags. 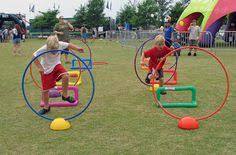 4 hula hoops or pails for bean bag toss. 4 hula hoops for Olympic ring challenge. 4 jump ropes or tape measure. 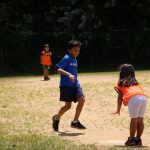 NOTE: In most of these field day games, one team is sitting out while the other two are playing except in box soccer and keep it up. Normally I would never want kids sitting out, but on long day of games, it’s welcomed by students. 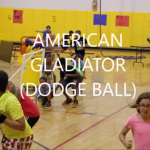 CLICK HERE To See Traditional Dodge ball & more! I hope you enjoyed these activities. Please feel free to leave a comment or question below. If you have any field day ideas, I’d love to hear about them! We are organizing a field day in the coming weeks and I have no idea where to start as I am very bad at leaving things until the last minute. Cheers for pointing out all these suggestions – these are awesome and I would have never of thought of half of these things to do – I just wanted to write a note here to say a very big THANK YOU for your help here! I’m so glad I could help! I’ve learned so much along the way from others and I want to pay it forward. If any questions arise, please don’t hesitate to contact me. 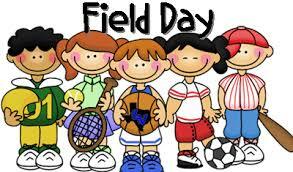 Have a great day and best of luck with your field day!